Experts and physicians on Thursday emphasized on raising social awareness against tobacco to save the nation from cardiac diseases. Speakers made the call while addressing a discussion meeting at Basundhara Addin Medical College (BAMC) in Dhaka on Thursday. BAMC organized the meeting styled ‘Tobacco and Cardiac Diseases’ marking the World No Tobacco Day’. Speakers also claimed that the rate of smoking didn’t reduce although the usage of tobacco products has been declined in the country. BAMC Principle Prof Abu Ubaid Muhammad Muhsin was the chief guest while Community Medicine department Prof Shameema Suraiya Begum presided over the meeting at college campus on Thursday. 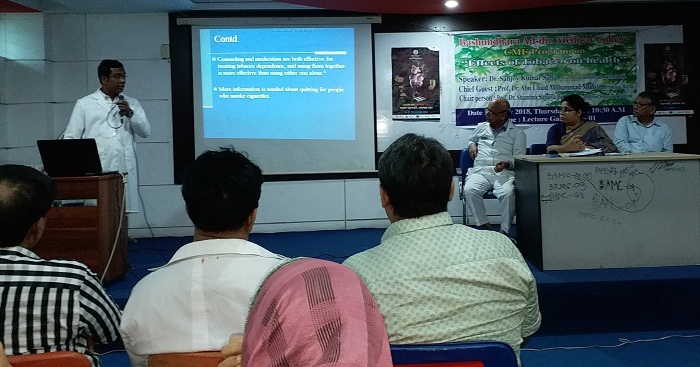 Medicine department Associate Prof Sanjoy Kumar Saha presented the keynote focusing of state of tobacco usage in Bangladesh. As a joint initiative of Bashundhara Group and Akij Group, the college started journey in 2014-15 academic year at its campus in Keraniganj, an outskirt of the capital.